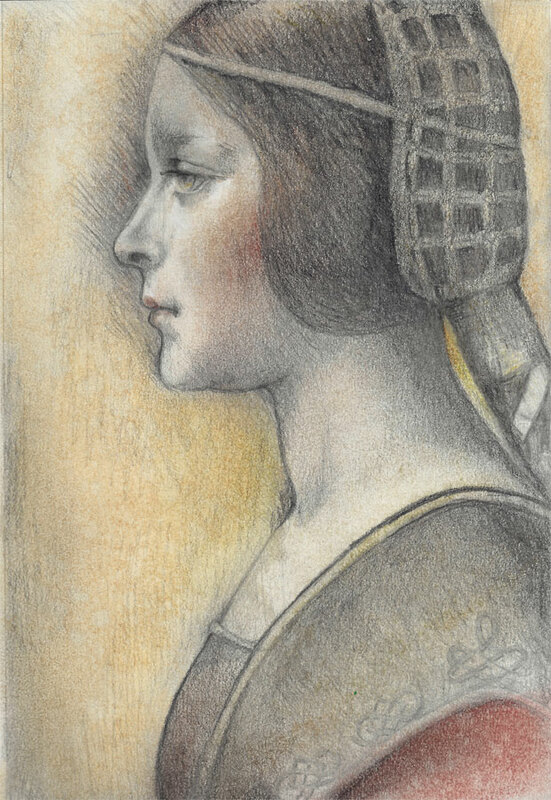 Looking through the latest National Geographic, I came across the story of a drawing that is purported to be a lost Leonardo da Vinci portrait of the illegitimate daughter of a patron in Milan (why can’t I have a patron???). This kind of story excites me to no end. Discovery, art, intrigue…turns out this undiscovered masterpiece was done for a book! You can read all about it or better yet go watch the episode on Nova. As of writing this, it was airing online. I was inspired to make a copy of it with easily gathered materials I could use on the couch while watching television. No sheep or goat-skin parchment around this studio and a pen nib and ink might have been messy between me and two cats, so I used paper (my sketchbook) and pencils, then I added some nu-pastels. It was a fun exercise and I am rather pleased with my result. The image is about 5×7. I have been fascinated by book binding since I was a kid, sitting on a pew in church on Sunday, studying the hymnbook’s construction. That was the first book I took note of a book being sewn together. (Captive that I was and nothing else to do!!!) I wondered how that was done. Now I know and find it satisfying to do. Not so, my 88 year old friend, Pam Windham, who became a book-binder after her stint in the Coast Guard during WWII. She was called into the office one day by her boss who told her she was wasting her life binding books (no way!!!) and that she needed to go back to school to do something worthwhile. Like binding books isn’t worthwhile, but she did and became a worthwhile teacher. Seems if I am not doing birds, I am doing faces. Here is a Sunday afternoon sketch in pastel pencil. This sketchbook paper didn’t really have enough “tooth” to hold layers of pastel so I was rubbing the pastel in to the point of making my fingers raw making it overly blended (I know I shouldn’t use my fingers, toxic pigments and all, I did switch to a stump after a while…), but the scan made the image a bit more grainy than the original. I hope you all have a great holiday tomorrow. Don’t labor too much! My very talented friend, Carol Massey, has for the past two days motivated some of her artist friends with an email asking how they intended to spend their snow day confinement. Just being asked how you intend to spend your day is motivation to do something and not just piddle the day away. Carol managed to create a wonderful pastel portrait yesterday and it was inspirational. This painting was done mostly in watercolour but has a goodly amount of pastel and gesso on it too. The base watercolor of a building (can you see it?) had been done perhaps 5 years ago and the woman was added today. Can’t wait to see how Carol inspires me tomorrow!